What is EVDO / Mobile Broadband? This article contains a plethora of information on EVDO and mobile broadband (how fast it is, how it works, what types of people use it, and more) - if you'd like to read just the basics and find out what you need to use mobile broadband, we recommend reading the concise "Mobile Broadband Basics" guide on 3Gstore.com (our sister site) that covers all the essentials: what you need in order to use mobile broadband, what the service options are, etc. Getting online and being able to connect with friends, family, news, and the office is more important now than ever, but what happens if you're one of the millions of Americans without access to traditional broadband like cable or DSL, stuck in a hotel without WiFi, or cruising at 65mph down the highway in your Winnebago? The answer is mobile broadband! Mobile broadband provides completely wireless internet access. You take the internet with you and surf the web in your car, on the train, in the airport, at a convention, on the road in your RV... you can even share the connection with multiple computers using a mobile broadband router, just like you could with your broadband connection at home! "Mobile Broadband" is a generic term that describes this type of internet connectivity, but there are a few related terms that will be helpful to understand. EVDO, or Evolution Data Only/Evolution Data Optimized, is a 3G mobile broadband technology used by Verizon, Sprint, and Alltel that provides typical download speeds of 600-1400kbps (with bursts up to 3100kbps) - this article focuses mainly on EVDO mobile broadband. HSPA is another 3G technology that is used by AT&T and T-Mobile (click here to read more about HSPA). 4G is the next generation of mobile broadband technology, but it's not as widely available as 3G service yet - Sprint uses a 4G technology called WiMAX that is currently being deployed, and Verizon will be deploying a 4G network using a technology called LTE in late 2010. For more information on 4G, read the What is 4G? article on 4Ginfo.com, our sister site. EVDO Rev-A is the current version of EVDO available from Sprint and Verizon. EVDO Rev-0 was the original technology. Rev-A is faster than Rev-0. All of the currently available EVDO modems from Sprint and Verizon are Rev-A. Allows the user to be connected wherever they are are not only for email, but for downloads, large files, photos, spreadsheets, etc. Always on with seamless roaming! No 300-ft range from the cell tower or "hotspot"
EVDO Rev A provides speeds of 600Kbps-1,400Kbps Download (bursts to 3.1Mbps), 500Kbps-800Kbps Upload (bursts to 1.8Mbps) - comparable to home DSL service. EVDO works similarly to the way your cell phone operates in that it relies on signal from a wireless tower rather than a physical connection like a phone line or cable. An EVDO modem (often referred to as an "aircard") receives the signal and allows you to connect to the internet - it's as simple as that! EVDO modems come in several formats: USB dongle, ExpressCard, PCMCIA card, or all-in-one hotspot (like the MiFi) and you can use them either directly in your computer OR in a 3G router. Of course, like your cell phone, the modem alone doesn't provide internet access - you must subscribe to the service from an EVDO provider. Sprint and Verizon both offer EVDO service for $59.99/mo with a 5GB per month allowance, and both charge overage fees for usage exceeding 5GB (Verizon also offers some alternative plans for the MiFi hotspot). For most people, 5GB is plenty of data for surfing the web, emailing, and the occassional YouTube video. For more information on what you can do with 5GB, read this article. EVDO Rev A has a peak data rate of 3,000 kbps, but realistic speeds average around 600Kbps-1,400Kbps Download with bursts to 2.0Mbps and 500Kbps-800Kbps Upload with bursts to 1.8Mbps. 1xRTT is a 2G (second generation) technology that has been available a lot longer than EVDO and is available just about anywhere cell phone coverage is for Verizon or Sprint. 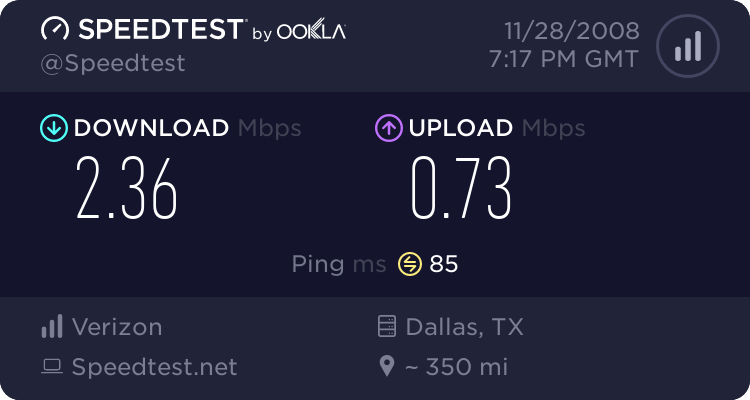 1xRTT has a maximum of 144K upload and download, but the typical speeds are 50K - 80K. When EVDO is not available, your EVDO modem or phone will automatically connect to 1XRTT if available. While considerably slower than EVDO, 1xRTT is a huge boon to travelers - if you find yourself in a remote location with no EVDO you'll still be able to remain connected! Who offers EVDO and what kind of devices are available? Sprint and Verizon are currently the leading providers for EVDO service in the U.S. There are multiple EVDO cards in PCMCIA, Expresscard, USB and 'portable hotspot' formats available. ALL of the currently available modems from both Verizon and Sprint are Rev-A capable and most feature external antenna ports where you can add an antenna or amplifier. Most of them are compatible with at least one 3G router. We have performed extensive tests on all of the modems and can confirm that there is no difference in performance between the available form factors; the various form factors simply provide options for different preferences. You can read more about why there is no performance difference between form factors here. In the early days of EVDO, Mac users were often "left out in the cold" as companies failed to provide support for their computers. Here at EVDOinfo and our sister site, 3Gstore.com, we have been providing tips and support for using EVDO with Mac computers since the beginning - even when Sprint and Verizon said it wouldn't work! Now, most new devices are Mac-compatible right out of the box, but support for Mac users is still weak. We are proud to offer comprehensive support to our Mac-loving customers! For more information on EVDO and Macs, read this article. Is there EVDO service at my home/office/destination? Both Verizon and Sprint offer EVDO in many areas of the USA, Puerto Rico, Canada, and Mexico (note: using EVDO in Canada and Mexico requires specific devices and plans). To check coverage at your location, you can enter your address or zip code on 3Gstore's coverage tool and compare Sprint's and Verizon's coverage. If EVDO is NOT available in a particular location, 1xRTT (aka "National Access"), may be available. In areas where EVDO is not available, your EVDO-enabled device (including aircards, USB modems, ExpressCards, phones, or embedded devices) will attempt to connect to the 1xRTT network. Generally, if your carrier has cell phone coverage in a particular area, there should be 1xRTT coverage even if EVDO has not yet arrived there. Another excellent resource is EVDOmaps.com, a free service hosted by the EVDOinfo experts that compiles actual test results from EVDO users around the country. This is NOT a coverage map but a place where users can post actual speed test results and descriptions of their gear, so that others can see what service was like at that moment in time, from that user's location. Can I share an EVDO connection with multiple computers/devices? EVDO modems are made to plug directly into your computer's USB port or card slot, but what if you have two computers that need internet access? You do NOT need a separate device and second line of service - simply plug the modem into a 3G router and share the connection! 3G routers like the ones sold by 3Gstore work just like the average cable/dsl router you might have used in the past for a home/office DSL or cable-modem connection, but 3G routers have the unique ability to support cellular modems as their source of internet connectivity. With a router that supports your cellular device, you can plug your USB modem, ExpressCard, PCMCIA card, or even your EVDO-capable cell phone into the 3G router and instantly create your own WiFi network! Read our router selection guide: Which Router is Best for Me? What about antennas and amplifiers? Signal strength can influence your modem's performance greatly. If you have a weak signal, an antenna and/or amplifier can improve your signal and thus your download and upload speeds. All of the currently available Sprint and Verizon EVDO modems feature ports where you can attach an external antenna and a wide variety are available, from the classic super-portable Booster Antenna to larger antennas that you mount to your home or office. If you need to provide a signal boost to multiple ceullular devices at once, this is possible as well with a wireless amplifier (AKA "repeater"). If you already have a mobile broadband device and you're wondering if an antenna/amplifier would benefit you, start here: Will an Antenna Help Me? Many Sprint and Verizon phones now feature EVDO capabilities, allowing for speedy web browsing and emailing on your cell phone or PDA. Additionally, many phones support "tethering", which means that you can use your phone as a modem - rather than connecting a dedicated EVDO modem (USB, ExpressCard, or PCMCIA card) to your computer or router you can connect your tether-capable phone and connect that way. Not all phones are tether-capable (even if they have EVDO) and tethering incurs additional monthly fees. It is also important to remember that most phones only support EVDO Rev-0 (all of the currently available data devices support Rev-A), and if you plan to tether often you should consider an EVDO Rev-A phone. Can I use EVDO overseas? Most of Europe uses GSM, which is not compatible with EVDO, so EVDO will NOT work overseas. Both Verizon and Sprint offer service in some areas of Canada and Mexico, however (requires appropriate international plan at additional cost). The Mobile Broadband Experts at 3Gstore are available by phone, chat, and email and will be happy to assist you with all of your mobile broadband needs - contact us today! EVDO Forums is a community site open to ALL EVDO users. The EVDO Forums boards are filled with great questions, answers, tips, and tricks from everyone from industry experts to the average user - stop by and join the discussion! 3Gstore is our retail site, where you can buy Verizon and Sprint modems and service, phones/PDAs, and accessories like routers and antennas for all 3G technologies (including AT&T's 3G). EVDOmaps allows actual EVDO users to upload their performance results and information about their equipment. 3G/4G Coverage Tool allows you to compare Verizon, Sprint, AT&T, and CLEAR data coverage side-by-side. Will an Antenna Help Me? Find out BEFORE you buy! Which Router is Best for Me? Compare the available routers to select the one that fits YOUR needs.